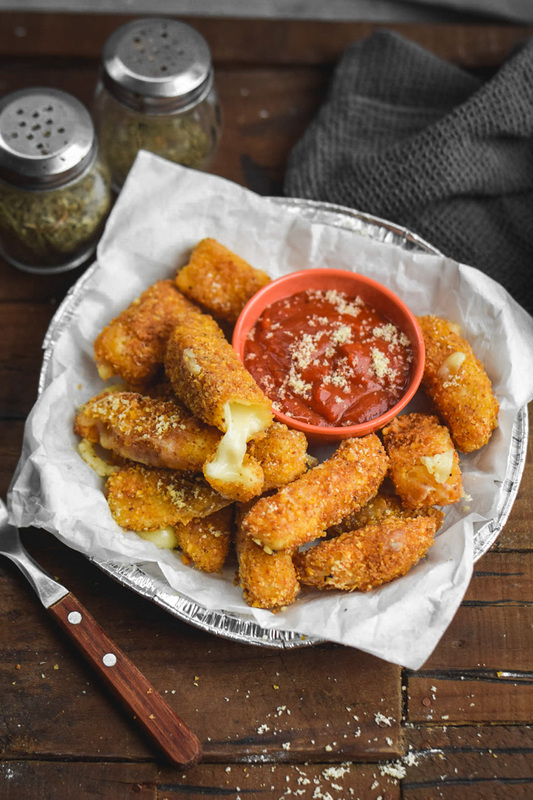 They’re melty, they’re crispy, they’re hot, and oh man are they CHEESY! 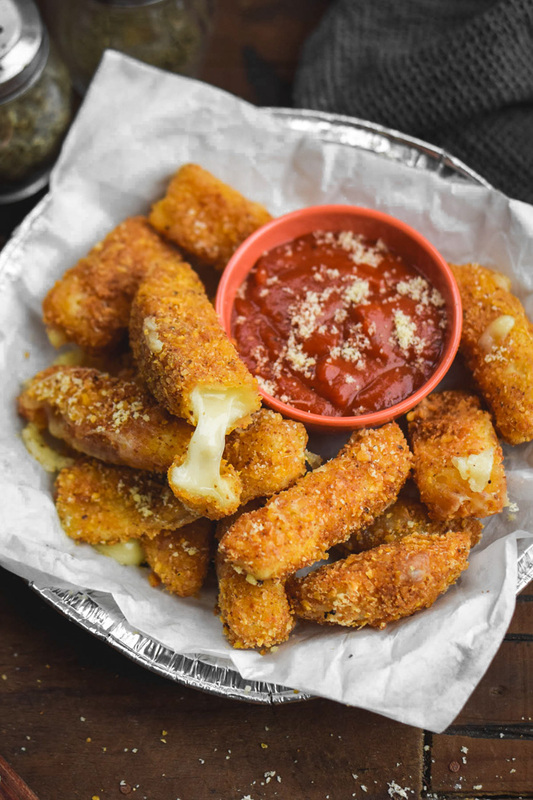 Yes, I made some all-time classic snacks to share today, mozzarella sticks, baby! 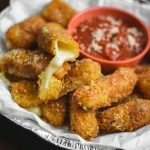 Mozzarella sticks are such a major crowd pleaser, it’s ridicuolous. Really, I can never believe how quickly they get devoured by my family, particularly the dudes, but actually everyone loves them. They’re essentially just a different form of pizza, right? Game-changers, that’s what these are. <-True stuff. That’s why I was so surprised the first time I tried making them with a dairy free alternative. I honestly didn’t think that it would work but they went over so well that no one could tell the difference. So I thought I could do it but I was wrong. I just simply can’t tell you about these without thinking of my sis. She’d tell you this herself so it’s not like I’m talking behind her back or anything, but when she was pregnant with my nephew she says that she literally ate an entire Costco-sized box of mozza sticks all by herself. Not only that, but they became her go-to morning sickness cure for some reason. I think the whole thing is super funny. Oh, and I’ve already practically sworn to make these for her when she’s going through that again. Although, it’ll probably be something totally different that she craves next time. I remember a friend of my mom’s telling us that she literally craved wall stucco during one of her pregnancies and my mom always craved crushed ice. We used to go to Sonic drive-in for months in a row just to get their specific shape of ice. So I feel pretty safe in declaring that these are well worth your time in trying them. There really is no comparing these to the frozen variety. I’m telling you, using the fresh and real mozzarella makes so much difference and then you can also have complete control over the flavor you want to coat them in. I like using Italian seasoning or sometimes I just use plain breadcrumbs. The best way to do them though, is to use some crushed chip crumbs mixed with panko. Whenever we have some mostly empty bags of chips lying around (usually left around the gaming room, messy boy) I save them for precisely this purpose and it is like a secret ingredient that makes them amazing.If you guys try these I’d love to know how you like them and please let me know if you have any questions or feedback in the comments! Is a party even a party without good snacks? 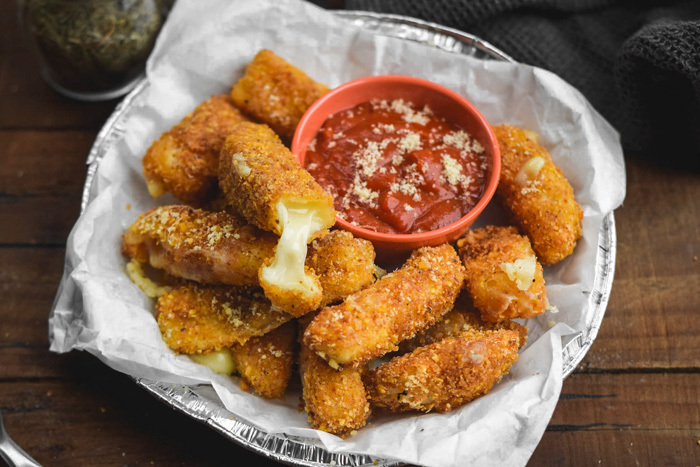 These cheese sticks are exactly what your next get together needs. Heat about 1/4 inch of oil in a medium skillet over medium heat (alternatively you can use a deep fryer.) Fry a few sticks at a time for 1 - 2 minutes per side, watching carefully if they start to melt into the oil. then remove to paper towel lined plate. Season with salt and pepper to taste and serve with warm marinara sauce if desired. I’m so glad you like it, Sandra! Thanks for stopping by! This low carb diet I’m on right now keeps leading me back to one cure-all fix: cheese. 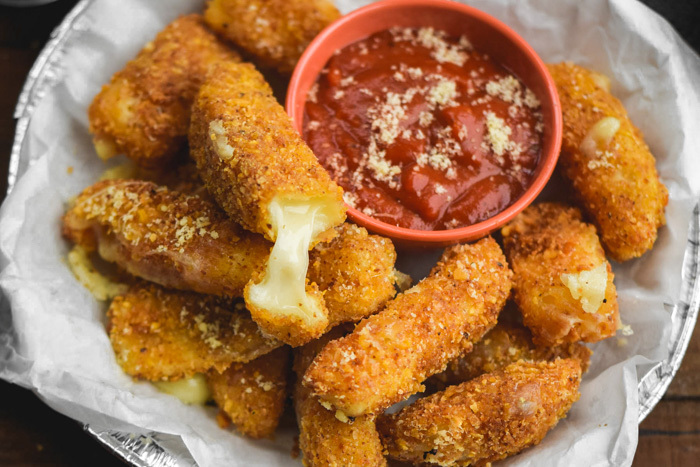 And this fried cheese? I’m totally head over heels for. Might be a little splurge, but definitely worth it!! Wow, low carbing is not the easiest and I know this from living with my Dad who has done it most of my life, but if your’e gonna blow it on something then yeah, I can’t deny these might be worth it. Thanks a million, Karly! They look yummy! I am trying my hand at it right now. I hope they turn out like yours. Wish me luck. I tried them ans they are pretty awesome. Thank you for the recipe. Oh, thank you so much for dropping by to let me know. I am so happy to hear that you enjoyed them! Just tried this recipe along with some homemade chili. It went really well. I use a deep fryer and it worked great. Very nice thank you! Thanks Savannah! I’m so happy to hear it!